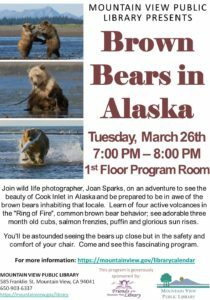 Join wild life photographer, Joan Sparks, on an adventure to see the beauty of Cook Inlet in Alaska and be prepared to be in awe of the brown bears inhabiting that locale. Learn of four active volcanoes in the “Ring of Fire”, common brown bear behavior; see adorable three month old cubs, salmon frenzies, puffin and glorious sun rises. You’ll be astounded seeing the bears up close but in the safety and comfort of your chair. Come and see this fascinating program.